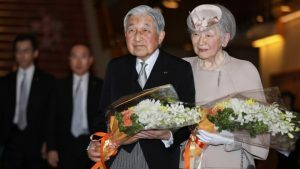 Japan’s Emperor Akihito urged his country to be open to the outside world at a ceremony marking 30 years of his reign on Sunday, ahead of his abdication later this year. Akihito will abdicate from the Chrysanthemum Throne on April 30, making way for Crown Prince Naruhito to replace him the following day. “Our country has cultivated its own culture as an island nation,” he said at the ceremony in Tokyo. “As the world has been globalised, I think we are now required to be more open to the outside, establish our own position with wisdom and build relations with other countries sincerely,” he said. Akihito also described his difficulties defining his role as emperor in the post-war era, and said he hoped his successors would think carefully about their symbolic status. “Since I was enthroned as emperor, I have spent time pondering how I am supposed to be as a symbol,” the 85-year-old emperor said, describing the process as “endlessly long”. The status of the emperor is sensitive in Japan given its 20th-century history of war waged in the name of Akihito’s father Hirohito, who died in 1989. Akihito has keenly embraced the more modern role as a symbol of the state — imposed after World War II ended. Previous emperors including his father were treated as semi-divine. He also expanded his role by actively travelling across Japan, particularly to meet with victims of natural disasters and visit sites that had been affected by World War II. His son Crown Prince Naruhito has indicated he plans to follow in his father’s footsteps. The post Emperor urges Japan to be ‘open to the outside’ appeared first on SABC News – Breaking news, special reports, world, business, sport coverage of all South African current events. Africa's news leader..